Once again, evil forces are at work threatening to revive Dracula, and it’s up to you to put a stop to it. You know what that familiar refrain means, right? Yes, once again it’s time to take a look at a Castlevania review of the game! 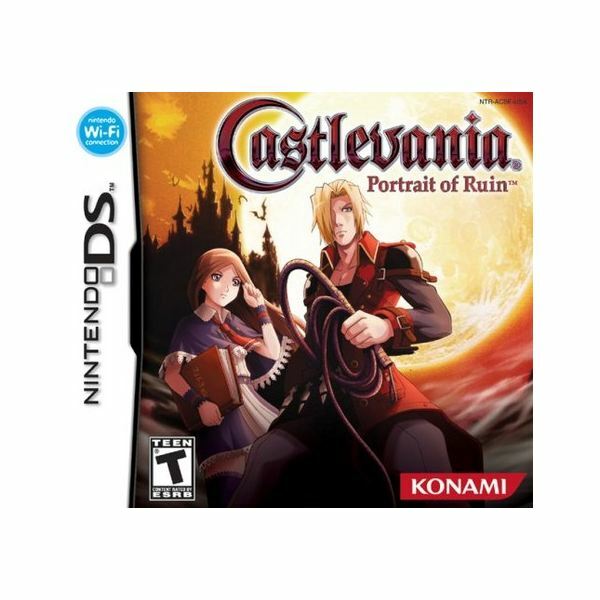 This time around, the subject of our Castlevania review is Castlevania: Portrait of Ruin, a 2006 Nintendo DS entry in the long-running Konami-created series. The second title of its kind to be released on the popular touch-screen handheld, Portrait of Ruin was also the first to include a multiplayer co-op mode. How does it compare to the more recently released Order of Ecclesia? Let’s find out, shall we? The game pretty much throws you right in the thick of things with very little in the way of exposition to establish things, which I wasn’t particularly crazy about. Stick with it, though, and little by little an intriguing storyline will begin to unravel for you. The game stars Jonathan Morris, the heir to the Belmont vampire-hunting legacy, and Charlotte Aulin, his spell-casting associate who is also a descendant of a family with ties to Castlevanias past. Together, they must stop the vampire lord Brauner, who is stealing power from Dracula’s Castle using magical paintings, as well as his daughters, who are working to help their father by reviving Dracula himself. Along the way they will also meet up with a haunted spirit named Wind who was bound himself to the castle for unknown reasons, as well as a priest named Vincent. There are many interesting twists and turns that develop throughout and even two radically different endings available. Perhaps its unfair to judge this against a game that was released nearly two years after it, but having played Order of Ecclesia first, I was disappointed with the visuals in Portrait of Ruin. The character sprites aren’t quite as sharp looking, and I prefer the more realistic look of the character portraits found in the 2008 release to the anime-style look found here. The environments are still rather impressive, though. The sound quality is still quite good, and there’s a tiny bit of impressive voice acting here as well. Again, though, I felt the soundtrack was lacking in direct comparison to Order of Ecclesia. All things considered, the production values are decent, though nothing here really stands out as remarkable, at least not in my point of view. Portrait of Ruin may not look or sound as good as Order of Ecclesia, but it’s definitely more enjoyable to play. The standard Castlevania gameplay is here, which means you’ll be doing a lot of exploring, fighting undead creatures and beastly monsters, and performing a lot of platform-style jumping. As with most of the handheld games in this series, your characters can level-up, change equipment and gain new abilities, RPG-style. Players can switch between Jonathan, the melee-combat specialist, and Charlotte, whose forte is casting spells, simply by pressing the X button. Furthermore, there are times where the duo needs to work together to overcome obstacles or take down powerful level bosses using their mighty Dual Crush attacks. Portrait of Ruin keeps combat fresh and entertaining by introducing a several different varieties of weapons and attacks to perform and a vast array of enemies to defeat. Also, it isn’t as frustrating or as difficult as Order of Ecclesia. To top it all off, exploring the massive, labyrinthine castle and portrait levels was completely addicting and had me hooked throughout. Of the two games, I definitely have to say that I had more fun playing this one. To sum up this Castelvania review, newer doesn’t always mean better. That is definitely the case in the head-to-heat comparison between Portrait of Ruin and Order of Ecclesia. Both games are quite good on the whole, and the newer release certainly sports better graphics, better music and better character designs. On the other hand, the gameplay is definitely stronger and more entertaining in Portrait of Ruin. I absolutely loved switching between characters and experimenting with different weapons and Dual Crush attacks, and it was fantastic being able to tackle boss fights without wanting to toss my DS halfway across the room in frustration, as would sometimes be the case in Ecclesia. Both games are definitely worthy of the four-star rating they have received, but if it came down to choosing just one or the other, I have to admit I’d go with gameplay over graphics and pick up Portrait of Ruin.